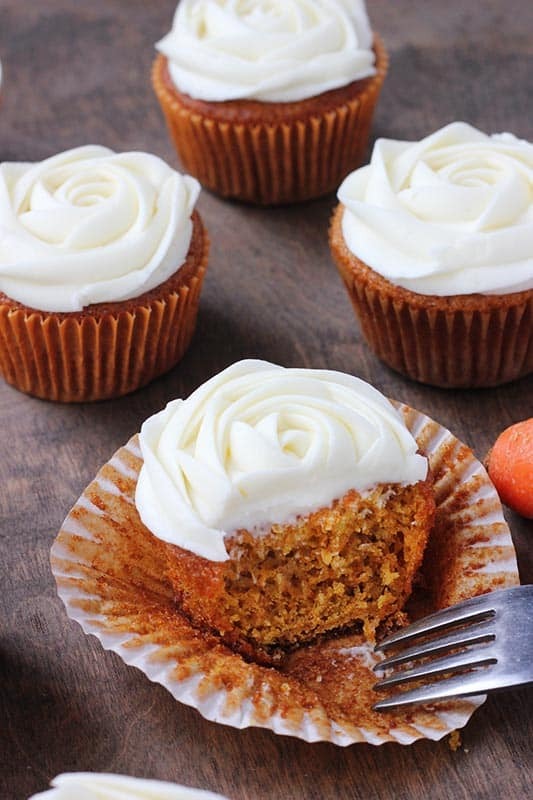 These soft and moist carrot cake cupcakes are made completely from scratch! Real carrots are grated and the sweet cake is topped with cream cheese frosting! 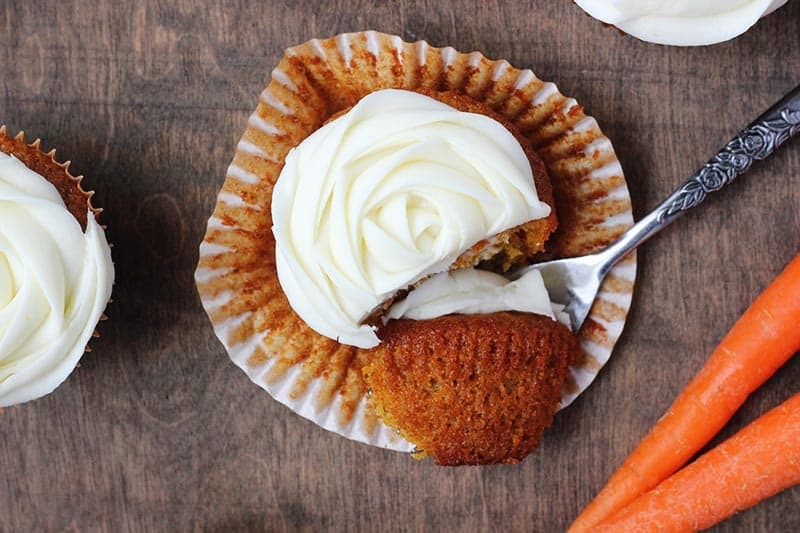 Ya’ll… These carrot cake cupcakes are about to change your life. They. Are. AMAZING. I am not a super big carrot lover, but when you mix those crazy veggies into your favorite cake batter and top it with a sweet cream cheese frosting… There is just something about them that is irresistible. The carrots add moisture and flavor that pairs beautifully with the nutmeg, cloves, and cinnamon. It is an all-around perfect cupcake recipe! How do you grate carrots for cake? 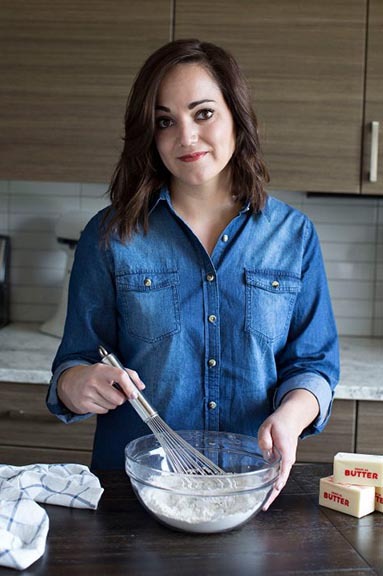 This is a very important step to consider before making your batter. In a pinch, you can purchase pre-shredded carrots in the produce department of your grocery store. However, we get the best results when we shred our own. Follow these easy steps. Use a peeler to remove the outside of each carrot. Use the smallest holes in your cheese grater and carefully move the carrot along the grater until you have enough carrot shredded for your needs. Alternatively, you can use a food processor. If stored properly, homemade cupcakes will last 1 to 2 days at room temperature. Since these are topped with cream cheese frosting I highly suggest you follow the next suggestion. Yes. It is suggested that any cake topped with cream cheese frosting should be refrigerated. Be sure to pull your cupcakes out of the refrigerator one hour before serving. I make these cupcakes for almost every big holiday. They are a crowd pleaser and incredibly simple to whip up. I occasionally substitute the oil for applesauce. This quick substitute gives them a slightly healthier finish with the same moist and decadent taste. 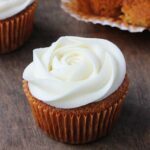 Use a 1M tip and a super simple, yet insanely delicious, cream cheese frosting and you have got a beautiful rose finish. 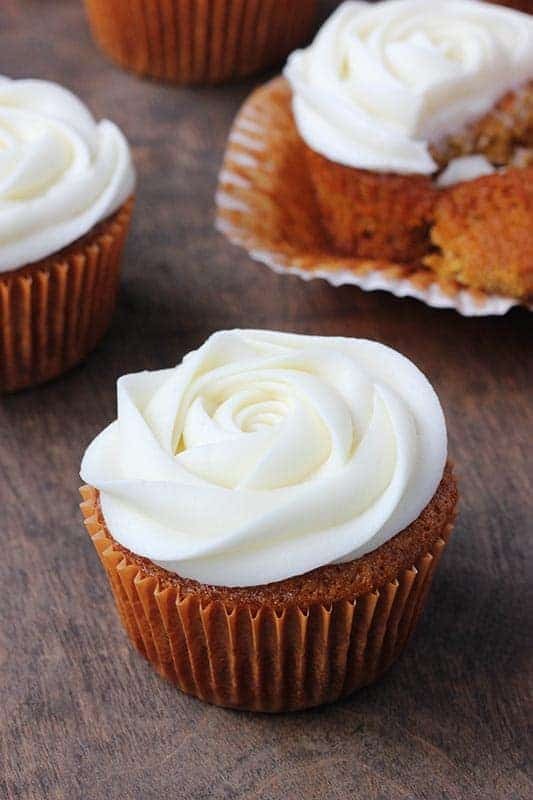 What is the best frosting for carrot cake? -Preheat your oven to 350 degrees. Line 24 muffin tins with paper liners and set aside. - Whisk together the flour, baking powder, baking soda, cinnamon, nutmeg, cloves, and salt. Toss the carrots in your flour mixture. - Add the sugars and eggs to the bowl of a food processor fitted with the blade attachment. Pulse until foamy. Slowly drizzle the oil in and mix well. Pour the liquid mixture into the dry ingredients, and stir until no flour can be seen. Fill liners 3/4 full and bake for 15-20 minutes. Yum! These look great. I have everything I need to make them (need to check on the cream cheese recipe) so I might just whip some up today. Thanks for sharing! I am getting my ingredients out right now, these look really yummy!! They look yummy… but I am not a carrot cake fan either. But your frosting job looks amazing! I will definitely give these a spin the next time I get called upon for mass baking duty. does the t stand for tablespoon or teaspoon? I’m in the process of changing all of those in my recipes. Sorry about that! Thanks! This receipe looks great! I like to use coconut oil, but you can use vegetable or canola. I was wondering how well this would work as a cake? I loved them as cupcakes by the way! Hi! I’m using carrots from my mother in laws garden, so, they are not all average size carrots. Approximately, how many cups of shredded carrots are needed? Thank you!! Please send your cream cheese recipe! The cooking time was too short and they were still gooey I had to double the time. Once they were cooked, awesome!